At Gatekeeper, we speak to a lot of prospective customers who come to market having known for a significant period of time that they need to improve their contract management disciplines. In some cases, there might have been a specific trigger like a missed renewal or a new hire into the legal or compliance function, but in most instances it’s simply an increasing awareness over time that has reached a tipping point. One of the reasons we’ve identified for this delay is a lack of a method for assessing the current level of performance in this area and the potential performance that could be reached. Given that the difference between weak and strong performance in this area can be anywhere between 5% and 35% of overall contract spend, it’s something that should be prioritised much more highly. And that’s before savings related to automation and improved risk-management are factored in. So, how can you go about assessing your current capabilities? Research and Business information firm, Gartner, have developed a model for just this purpose. 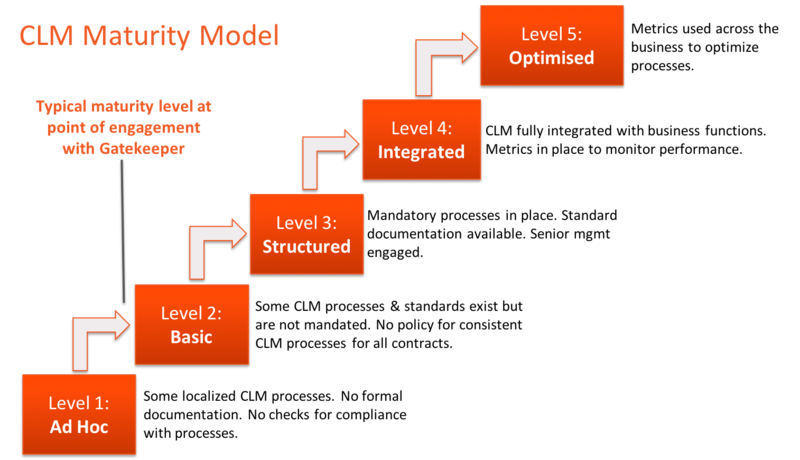 Their model has five maturity levels based on the increasing effectiveness or capability of an organisation's CLM processes. The key principle is that there’s an inverse relationship between capability and risk, so the lower a business’s capability in this area, the higher the risk to which the business is exposed. The model allows an organisation to determine where it sits on the capability continuum – its current maturity level – and provides a roadmap for improvement. Some localised CLM processes are in place here and there, for purely local purposes. There is little to no formal or consistent documentation, the processes are applied to contracts only sporadically, and nobody is checking for compliance with the processes. A few basic, organisation-wide CLM processes and standards exist, but are not mandated for use everywhere and are used only for contracts meeting certain standard criteria. Formal documentation exists for these contracts, but is not available everywhere. There is no policy regarding consistent CLM processes for all other contracts. Mandatory organisation-wide processes and standards are applicable everywhere. Formal documentation is available everywhere. CLM processes and documents are specific to each unique contract type. Senior management is engaged and involved. CLM processes are fully integrated with other key business processes such as financial management and performance management. Certain end-user customers join with people from other business function to form part of buying and selling contract teams. Metrics are used to measure aspects of the CLM processes, and inform contract-related decisions. Across the organisation, performance metrics are used to assess the quality, efficiency, and effectiveness of CLM processes. A continuous improvement approach, and streamlining initiatives along with lessons learned and best-practices programs, are applied to the CLM processes. When you read through these five levels, you’ll likely be able to identify which one most closely resembles your business at the moment. This will give you a good idea about what the steps are to take to reach higher levels of maturity and therefore to begin benefitting from lower costs, more efficiencies and lower business risk. It’s also important to bear in mind that finding the right technology is only one part of improving maturity levels. You need to coordinate your processes and people to embed CLM throughout your business. You can read about this in our related article – Two things you must do before selecting a Contract Management Solution. The right technology will then facilitate the automation, the tracking and the measurement of your CLM processes. If you would like more information on how to improve your CLM maturity levels and how to embed the right disciplines and technology in your business then contact us today for a free consultation.